In 1844 Mrs Ann Cooke made photographic history becoming England’s first woman professional photographer. Ann transformed personal tragedy into an opportunity to support her family, becoming an early pioneer of Daguerrotype photography in England. Ann Holmes was baptised on 22nd May 1796, daughter of Robert and Mary Holmes of Lincoln. In 1816 Ann married Robert Cooke, Clerk to the Lincoln Poor Law Guardians and Superintendent Registrar, at St Mary le Wigford, Lincoln, a marriage destined to last twenty seven years. According to the 1841 census of Steep Hill, Lincoln, Ann was five years Robert’s senior; the census also detailed their nine children- Robert (20), Mary (15), Edward (15), Ann (13), Sarah (11), Harriet (10), John (8), Jane (7) and Joseph (3). Ann’s role was clearly defined as full time wife and mother, but two years later her role would change to breadwinner following the untimely death of Robert at the age of forty six. Four months after Robert Cooke’s death, Daguerrotype patent holder Richard Beard visited Kingston upon Hull to invite a purchaser for the ten year exclusive license to provide photographic portraiture. The license was purchased by Ann’s brother Edward Holmes, and established the “Photographic Portrait Rooms” at 6 George Street, Hull. 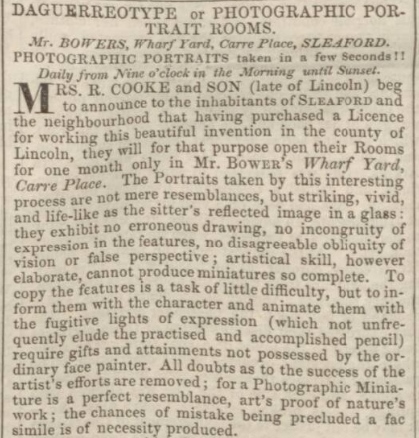 On 31st May 1844, The Hull Packet and East Riding Times hosted a front page advertisement of photographic portraits at 6 George Street, Hull, without reference to Mr E. Holmes. Ann purchased the Daguerrotype license for the familiar vicinity of Sleaford, Lincolnshire, sharing the new photographic enterprise with her second son Edward. Her introductory advertisement in the Lincolnshire Chronicle on 6th September 1844 informed the inhabitants of Sleaford that she had purchased a license for the county of Lincoln. In a confident, persuasive presentation, Ann lists many applications of the Daguerrotype process including providing copies of plans, paintings, sculptures, animals, landscapes and articles of virtu. Photographic portraiture was produced “with all the freshness, delicacy and warmth of the most exquisitely painted miniature”. Mrs R Cooke and Son of Wharf Yard, Carre Place announced their termination of business from 9th November 1844. The family then moved to Hull where Ann’s daughter Mary married on 3rd December 1844, documenting her address as 6 George Street, Hull. The move was later confirmed when Ann became the new George Street photographic studio owner in 1845. Henry Mann was appointed to manage the George Street business allowing Ann to expand her services to the Victoria Rooms, Queen Street, Hull. Ann’s Victoria Rooms advertisement reflected her growing confidence in the business world. But in 1851 Ann Cooke took a major step into photographic history, becoming the first and only woman in England to declare their occupation as a “Photographic Artist”. She joined fifty men in the same inaugural classification. The 1851 census also shows Ann’s employment of Annie Dixon, portrait painter, probably to assist hand colouring the Daguerrotype images. Ann closed her photographic studio in 1857, converting her premises to alternative use as apartments. The large Cooke family expanded further with the marriage of daughter Jane to John Watson in October 1858 and daughter Harriet to Alfred Parkes Jones in the final quarter of 1858. In 1861 the census describes Ann as “Formerly Photographic Artist”, indicating her retirement from a ground breaking career. The Hull Packet Friday 04 November 1870 reported the death in Manchester of Mrs Ann Cooke, late of George Street, Hull, aged 75. She was buried at the church of St Saviour, Manchester. Mrs Ann Cooke remains one of the most significant yet unsung women pioneers of photography, transforming life-changing adversity into opportunity, encouraging future generations to follow her inspirational example. Saint Peter Eastgate, Lincoln FHL Film Number 504565. 18th August 1816 FHL Film Number:1542057 Heathcote Archive also documents witnesses – Mary Holmes and John Wood p.11 Entry 33. Lincolnshire Chronicle – Friday 06 September 1844, , p.3. col.6. Lincolnshire Chronicle – Friday 01 November 1844, p.3. col.4. Hull Advertiser and Exchange Gazette – Friday 14 August 1846, p.1, col.3. Hull Advertiser and Exchange Gazette, Friday, August 14, 1846. P.5 col. 3. Hull Advertiser and Exchange Gazette, Friday March 19, 1847. P.4 col. 3. 1851 Census – 6 George Street, entry no. 7 Annie Dixon, Lodger, aged 34, Portrait Painter born in Horncastle. Hull Advertiser and Exchange Gazette – Friday 19 May 1854, p.1, col.3. Hull Advertiser and Exchange Gazette – Friday 03 March 1854, p.1, col.5. Hull Advertiser and Exchange Gazette – Friday 12 August 1853, p.1, col.3. Ancestry.co.uk – Alfred Parkes Jones Marriage to Harriet Cooke in Hull, Yorkshire East Riding, Volume 9d, page 439. 1861 census – Ann Cooke, Mother in law, Widow, age 64 residing with Alfred P Jones, aged 29 at 7 Napier Terrace, West Sculcoates, Kingston upon Hull. Hull Packet and east Riding Advertiser, November 4th 1870, p.8 c.6. Cooke – October 24th, aged 75 years, Mrs Ann Cooke, late of George Street, Hull. According to 1871 census, Ann’s son in law John Watson was a clergyman living in Chorlton, Manchester, with wife Jane, also with his brother in law Alfred P Jones and wife Harriet (formerly Cooke). Burial records of St Saviour, Manchester – Ann Cooke Buried October 31st 1870, aged 75.